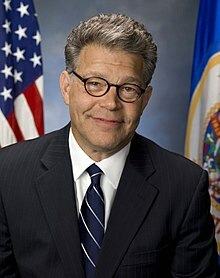 Alan Stuart "Al" Franken (born May 21, 1951) was a United States Senator from Minnesota. He is a member of the Minnesota Democratic–Farmer–Labor Party, which affiliates with the national Democratic Party. Before he was a Senator, Franken was a writer and actor on Saturday Night Live. Franken was also a left-wing pundit and has written several books on politics. His second cousin was actor Steven Franken. On December 7, 2017, Franken announced in an address before the Senate that he would be resigning from his office following sexual harassment claims. ↑ Franken was elected to the term beginning January 3, 2009, but did not take his seat until July 7, 2009, due to a recount and subsequent election challenge. ↑ "Al Franken worth between $4.3 million and $9.9 million". Associated Press. 2009-05-22. Retrieved 2009-01-05. ↑ Watson, Kathryn (7 December 2017). "Sen. Al Franken says he's resigning -- live stream updates". CBS News. Retrieved 7 December 2017. Wikimedia Commons has media related to Al Franken.